Wyatt started preschool this week and for the first time ever, I’ve had to start packing him a lunch. This whole lunch thing has had me a little worried because we usually give him a hot lunch and we don’t have a lot of cold lunch ideas in our picky preschooler repetoire. I don’t know how I’m going to come up with lunch ideas four days a week. I can’t send him to school with PB&J every day can I? I have decided to make the best of it though. When Wyatt told me he wanted to have a “fancy lunch box” like mine I actually started getting excited. 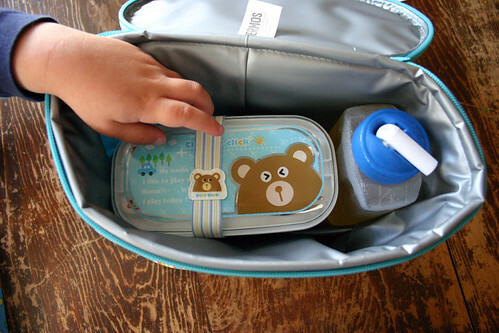 He’s been eyeing my bento supplies for a while now and loves to look at the little cups and bottles I use so I began to think that we could have some fun with these lunches. My Mr. Bento is waaaaaaay too big and holds too much food for him to eat so I knew we wouldn’t be going in that direction, but I convinced him to get a couple of smaller bento boxes that are made just for kids and he’s pretty thrilled with them. We also got him some “juice box” type water bottles, some reusable ice packs and an insulated lunch box to carry it all in. It all fits together perfectly. The first day I sent this lunch: strawberries, bread, white cheddar Cheez-its, Laughing Cow cheese and deli turkey rolled up real purty like. He ate: strawberries, one chunk of bread, a wedge of cheese and one turkey roll-up thing. He was so hungry when his dad picked him up at one (he’s only doing half-days this week) that Zach bought him a piece of pizza. I’ve decided he was just excited and that’s why he didn’t eat my nutritious and delicious lunch — not because it sucked. Wednesday I sent this: a chopped up cheese stick, lots of strawberries, gold fish crackers and a PB&J sandwich cut into heart and teddy bear shapes (because I love him). He ate: everything but the gold fish! Score! Today’s lunch was: cheddar rice crackers, grapes, a cheese stick, and a turkey and Laughing Cow cheese sandwich cut into kitty, giraffe and cow(?) shapes. I put the smiley faces on the cat with catsup and as soon as I finished Wyatt told me he wanted angry faces on the cats. Oh well. He ate: everything except one of the kitty sandwiches! Woooo! Go Mama! I am finding this to be incredibly fun so far. I’m sure the thrill is going to wear off soon enough and packing a lunch will become its own form of drudgery, but for now it’s great. I do still need more ideas for what to pack in his lunch though. I know I’ll always be able to put fruit, crackers, and some cheese in, but I’d love to have some other stuff that I can make ahead and just throw in there in the morning. I’ve seen some good tutorials on making and freezing rice in cute shapes and I’ve been thinking about making a batch of granola bars too. Anyone have some clever ideas? 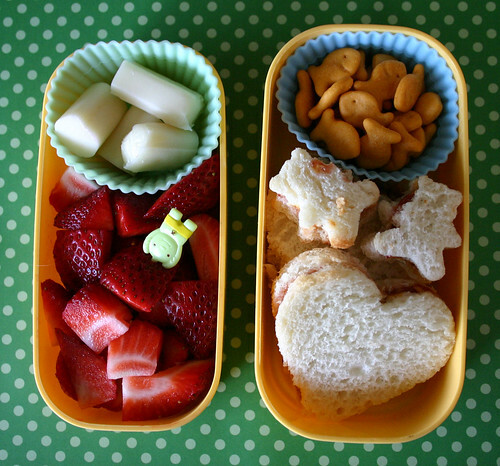 For many more ideas for preschool lunches and bento boxes, please check out the bento category on my blog here. 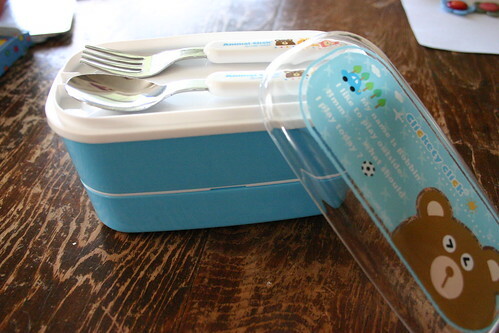 I’ve also answered some questions about the supplies I use for my bentos in a post over here. 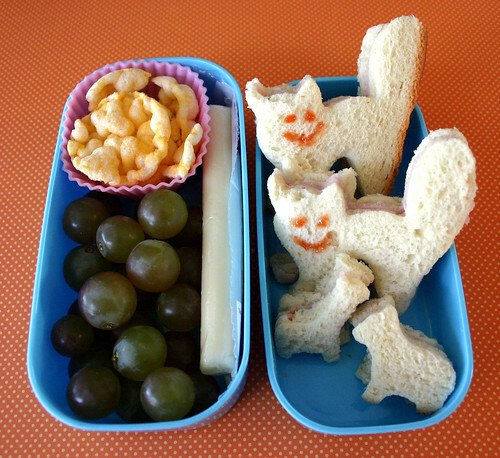 And I’m constantly adding photos to my preschool bento set over on Flickr, so you can see more ideas there.